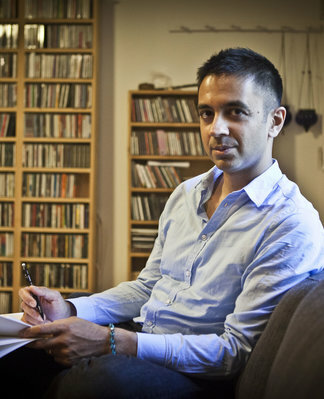 For the second edition of this series, Vijay Iyer has picked some of his favourite music with electronics. Iyer is a Grammy-nominated composer–pianist who has released 20 albums — most recently Break Stuff — and collaborated on many more. He was named DownBeat Magazine’s 2014 Pianist of the Year, a 2013 MacArthur Fellow, and a 2012 Doris Duke Performing Artist. In 2014 he began a permanent appointment as the Franklin D. and Florence Rosenblatt Professor of the Arts in the Department of Music at Harvard University. Iyer’s selections range from instrument + laptop duos to studio tracks, including the late David Wessel’s innovative “SLABS” performance interface. Thanks so much to Vijay for providing these insights into his listening world. Below you can watch video of an improvisation with saxophonist Steve Coleman and you can hear much more on his website.